About a month into the school year, a lot has happened on campus — but what about you in your spare time? It’s easy to answer with an innocent “not much,” but what are Tech students really up to? Of course, studying and doing homework takes a high spot on everyone’s list (and it should). Once work is out of the way, however, many students seem to enjoy playing active roles in community organizations such as RoboJackets, Intramurals or Greek life. If some spending money is what you are looking for, try finding an on-campus job. Isabel Jaffoni, first-year MTH, works part-time. From her experience, on-campus jobs are a good way to make money and gain work experience while having some flexibility with your personal schedule. Other students recommend starting early on enhancing your resume. “I like to look for research opportunities and look for clubs to see if there are any cool projects I can do that would look good on my resume,” said Hal Dang, third-year CS. If you join a club that interests you, chances are you will find friends with similar interests. While it is important to make friends, it is equally as important to maintain those friendships. Taking time to de-stress in your free time is an underrated aspect of having a successful first year, and Tech offers a variety of opportunities to do so. 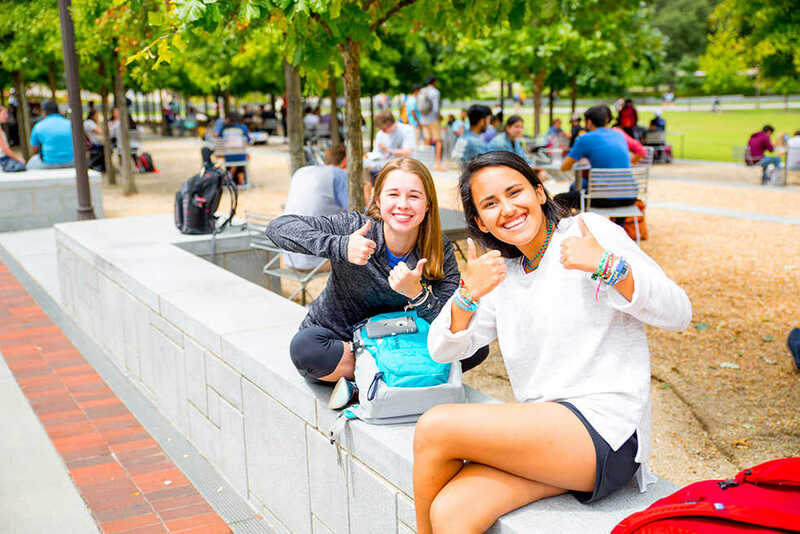 Being in the heart of Atlanta, a city budding with the arts and great brunch spots, it only makes sense to explore it during your first year at Tech. Madison Novak, first-year BME, said she likes to spend free time walking around Piedmont Park. “It’s a really nice place and it doesn’t take too long to walk there either,” she said. Gillian McPherson, first-year CHBE, said she likes seeing live music. “The Tabernacle is one of my favorite venues. One of the things I love about Atlanta is how many bands come to tour here and how many venues there are.” There’s almost always a show going on somewhere and the experience can be enjoyable even if you are not familiar with the band. But you don’t have to go too far to have some fun in your free time. Hitting up the CRC is always a great way to add to your daily exercise regime of walking around campus. Chasse Rush, first-year CompE, frequents the gym. He has a set exercise regime and focuses on a different body part each time he goes. “I always start with pull-ups too, no matter what I’m working on. It gets you pumped up and your blood running,” said Rush. Sometimes it’s easier to stay inside than to make the trek over to the CRC or Piedmont Park. Luckily, there’s plenty to do in your dorm room too, where you can maintain the teetering balance between studying and Netflix. In case you missed it, it is football season and many students enjoy following it in the forms of flag, fantasy and Madden 18. Residents of Smith have active game sessions, where first-years and PLs gather and play fun board games, card games or even have video game tournaments. Tech has a lot to offer so that there is never a dull moment. It’s easy to get bogged down in academics, but remember to take some time for yourself. Do something fun or something stress-relieving so that you can be at your best when it comes time to sit down and do work.